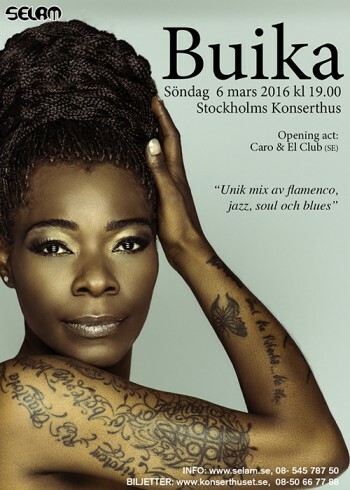 Buika is not limited to one specific type of music, but has created a unique mix of flamenco, jazz, soul and blues. She is the daughter of political refugees from Equatorial Guinea and grew up in Palma de Mallorca among Spanish Roma, who inaugurated her in the traditional “cante” flamenco. Her personal background has been emulated in her music, which she combines with elements of soul, hip hop, jazz, copla and flamenco. Buika released her first album, Buika 2005, and starred in several Deep House productions. Her second album; Mi Niña Lola won the award for Best Produced Album at the Premios de la Musica, the Spanish equivalent of the Grammy Awards, produced by renowned producer Javier Limón (Bebo Val-des / Diega El Cigala: Lagrimas Negras, Paco de Lucia and many others). Her third album, Nina de Fuego, contained mostly songs written by Javier Limón, and Buika herself, along with remakes of classic Spanish Coplas and a Mexican ballad. Over the years, Buika caught with a range of creative collaborations, including with Anoushka Shankar and Yasmin Levy. In 2011 she performed two songs, “See Me Hizo Fácil” and “Por El Amor de Amar” the Pedro Almodovar film “The Skin I Live In”. On her aptly titled Vivir Sin Miedo (To Live Without Fear), she makes a striking departure from the Spanish raga flamenco, Latin jazz and world music for which she is known, into something best described as global pop. For the first time, she sings more in English than in Spanish (and often mixes the two). Warner Music Latina released the album October 16. Buika wrote or co-wrote all of Vivir Sin Miedo, which she co-produced with Martin Terefe (Mary J. Blige, Jamie Cullum, Coldplay) and recorded in Miami, New York, London and Madrid—a series of cities as global as Buika’s artistry. Buika co-wrote and sings the album’s first single, “Carry Your Own Weight,” with Jason Mraz, one of her many artist fans. While “Carry Your Own Weight” reflects Buika’s growing connection to the U.S., where she has been based since 2011, she remains grounded in the music of her native Spain, collaborating on the song “Waves” with the great flamenco singer Potito.